Tags: "Brick branch", "Ocean County Library"
An audience of 55 enjoyed an afternoon of music, dance and food on Saturday, August 9. Members of the FAMAR Filipino-American Artists Society Chorale and Dance Troupe put on and engaging and entertaining performance. Dressed in native costumes, the performers shared songs and dances from their Filipino heritage. An extra special treat came after the performance, as many of the FAMAR members brought in traditional Filipino dishes for everyone to sample. The audience left full with music in their hearts and yummy food in their stomachs! 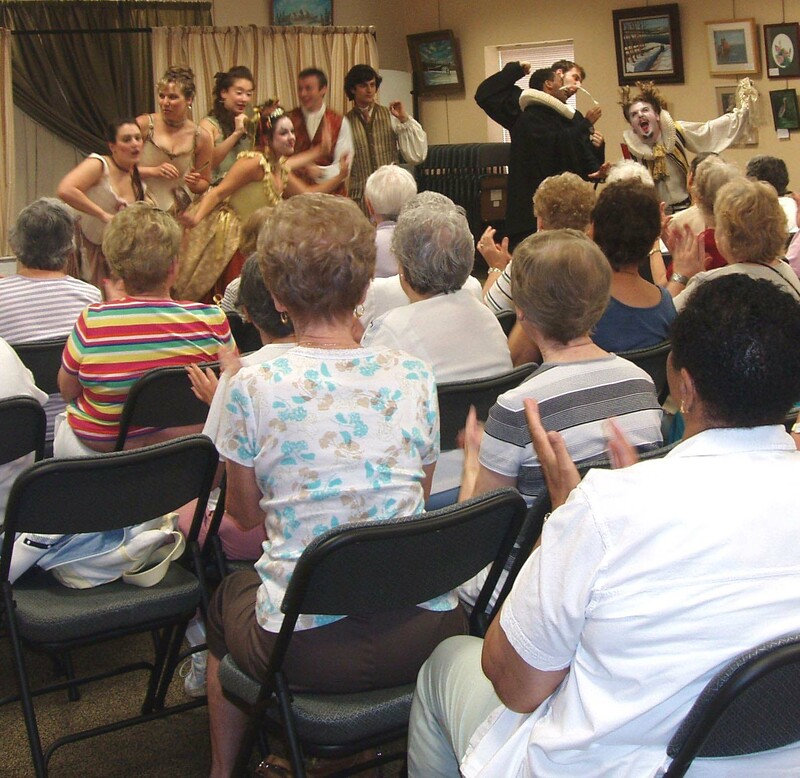 Next Stage Ensemble, a summer touring troupe that is part of the Shakespeare Theatre of New Jersey, performed Molière’s comedy “The Learned Ladies” at the Brick branch on Saturday, July 26. The 64 audience members thoroughly enjoyed this witty performance, which was sponsored by the Friends of the Brick Library. “The Learned Ladies” tells the lively story of three young women who are all very interested in a poet quite lacking in poetic ability. 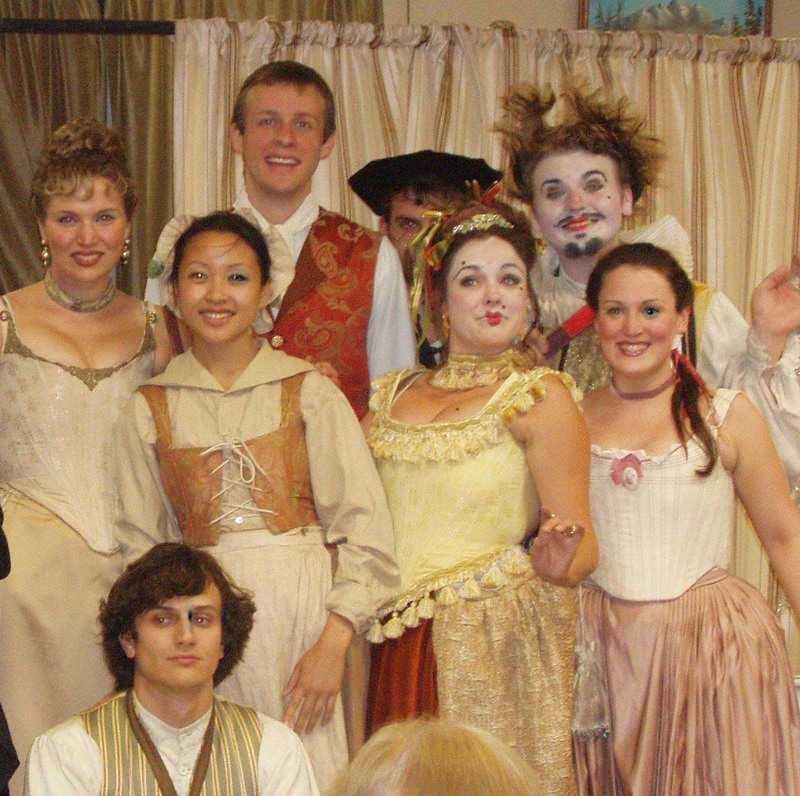 All the actors and actresses dove into their roles with passion, complete with full make-up and costumes. Everyone was also impressed with all the hard work of the performers, as they are the ones putting up and tearing down the sets before and after the performance. If you haven’t ever seen Next Stage Ensemble in action, try to catch them during the summers as they are highly recommended. Lacey Day 2008 Another Successful Outreach Event! Over 5,000 people attended the event on Saturday the 16th at Gille Park in Lacey. The Lacey Branch is always part of the fun. Take a look at some of the pictures! The Diversability Focus Team will sponsor a program designed to help people cope with panic. The workshop will be held 1 p.m. Monday Nov. 10 at the Manchester branch. Anxiety and stress can come from the way in which we respond to our past and present situations. Many people have the tendency to bring circumstances from the past into the present. This workshop will help you identify situations that may be unresolved in your life and change your perspective with regard to them so that you can feel more in control. The program is presented by Panic Relief, a non-profit organization whose mission is to educate those suffering from chronic anxiety, agoraphobia and panic attacks on techniques for overcoming their condition. The program is free and open to the public. Register online at our Web site www.theoceancountylibrary.org or by telephone (732) 657-7600. JACKSON – Come share the joy of Filipino heritage with FAMAR on Saturday, September 20, 2008 at 2:00 pm at the Jackson Branch of the Ocean County Library. We will have singing, dancing and food, Filipino style. The performers of the Filipino-American Artists Society Chorale and Dance Troupe will share their heritage through native dances, songs and musical instruments. Filipino treats will be served. Registration is requested. This program is free and open to the public. Registration is requested. Register online at www.theoceancountylibrary.org or call the Jackson Branch at 732-928-4400. It may be about time to dig out that old library card. Hoping to draw back readers, libraries have vastly expanded their lists of digital books, music, and movies that can be downloaded by their patrons to a computer or MP3 player – and it doesn’t cost a cent, unlike, say, media from Apple Inc’siTunes or Amazon.com Inc. In honor of Native American Heritage Month Tchin, a nationally known Blackfoot/Narragansett artist and storyteller, will present two programs at the Jackson branch on Saturday, November 8. In these energizing and captivating performances, Tchin plays and reveals the mysteries behind the rarely heard Native American courting flute. Tchin will tell special stories passed down through generations, providing a unique, entertaining, and powerful experience for his listeners. The 40-minute program for children in Grades K – 4 will begin at 1 p.m., followed by a 2 p.m. program for young people in Grades 5 – 12.